Can you believe Written in Love is being released one week from today? Have you preordered your copy? To celebrate its upcoming release, I’m giving away a copy of Written in Love a day until March 14th. To enter, sign up for my newsletter. The sign-up form is on the right side of the page. It’s that simple! If you’ve signed up for my newsletter in the past, you’re automatically entered. 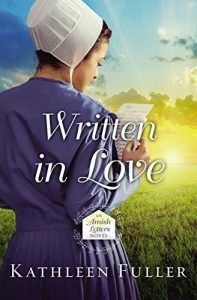 Written in Love is the first book in the Amish Letters of Birch Creek series. I’m really excited about this series, which introduces some new characters from the growing community of Birch Creek. Stay tuned for more fun stuff as we countdown to launch–contests, exclusive content, and fun facts. Oh, and be sure to pick up your copy at your local bookstore, or click here for links to online retailers. Thank you! I am already subscribed to your newsletter. I am looking forward to this book and would be so estatic to win. Amish stories are my absolute favorite. I love their simple but hard way of life. I am going to try some of the recipes you pinned. I have an Amish cookbook that i love. God Bless!! I so enjoyed the copy of The Reluctant Bride Laura sent me while recovering from surgery. My sister is enjoying it now. I WILL BE buying all of your books, but to win one, would be great too. Hope to meet you in August when I’m up for my class reunion. Already a subscriber .Looking forward to reading your latest book. Thanks for the chance to win. Love your books.